Wacky power #5 – Doctor, will my internal antenna give me a brain tumor? This is one of the wackiest of them all. This is ability is wacky to the point of later having been outright denied in other sources. 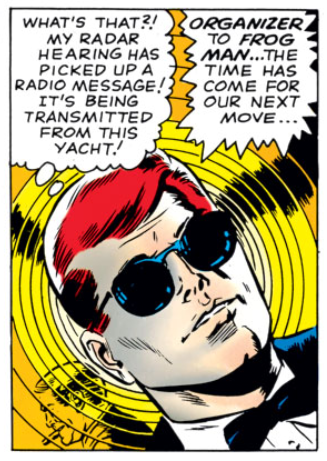 Early on in the history of the comic, Daredevil’s radar sense was often depicted as a kind of internal, all-purpose radiation/radio signal detecting device rather than as the simple, yet powerful, “proximity sense” we are used to seeing today. In the panel below, the idea of detecting a radio signal was taken a step further, however, to the point where Matt is not only sensing the presence of a radio signal but actually hearing the message! The below is from Daredevil #10, written and penciled by Wally Wood, also reprinted in the second Daredevil Annual from 1970. I think Matt is probably grateful he doesn’t actually have this ability. Can anyone imagine the agony of picking up every radio signal going through the air on every frequency? I think most of us would probably pass on that one. For the rare science geek who might be interested in how a radio receiver actually extracts the message from a radio signal, here’s a nice pedagogical chart. Enjoy! I’m going to state right off the bat that, as I’m sitting down to write this, I don’t have a proper title yet for this post. No more print reading for Waid’s Daredevil? This is one of the earlier issues, right? In it, it is safe to assume that Matt isn’t yet so well experienced in the functioning of his senses. Notice how he says: “Radar hearing”. Needless to say, he doesn’t have any “Radar hearing”. It has been told countless times: his powers are “enhanced senses” plus a “radar sense”. 1) Due to a still unclear grasp of the functioning and recyprocal interactions of his own powers on his part, he calls his enhanced hearing “radar hearing”. 2) He has just caught the conversation, coming from where the radio is located, with his enhanced sense of hearing. Well, I think you may be right about Matt being confused regarding what sense he uses for what and how it all comes together. It’s not like he ever went to the doctor and said “Uhm, well… I can sort of sense things, and I hear really well too. Could you maybe do an MRI and see if maybe my brain has been fried somehow? Perhaps something to do with radiation?” He doesn’t really know what causes his radar-related perceptions, nor do the writers (as I will show in some posts coming up). Words like “radar hearing” and “radar senses” (plural) have been used from time to time throughout the history of the book. And thanks for liking the title! 🙂 I like to come up with witty topic headings, especially for the Wacky powers series. Yep, it’s just his enhanced hearing, not the writer saying his radar sense was decoding the radio transmission. Or perhaps I’m misunderstanding what you’re saying? Yes, I think you’re misunderstanding what I’m saying. I didn’t mean that he doesn’t know that his accident caused his senses to be heightened, I’m saying that he doesn’t know the mechanics underlying how the radar sense works. See my radar series for what I mean exactly. yes.. this one certainly takes the cake (as far as ive read)… this is good example of how the past can recur to haunt us…. whoo boy… scary, imagining taking in evything radio?.. wow… and we wonder why matti’s had it so rough for so long an so forth… is a wonder poor dude is still mwf and not mws (man w/out sense.. at all).. haha.